All locks with keypads in this category can be ordered with an optional key override. 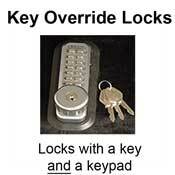 Locks with key overrides have an over-sized knob in order to accommodate a key cylinder. IMPORTANT: due to the inherent problems of keypad locks with keys, they are not covered under the manufacturer’s Life-Time Warranty.